Is LottoByText a Scam or Legit? Read 3 Reviews! LottoByText Exposed — Full System Scan Is Required! Lottobytext.co.uk is a very busy site. I must confess I was totally sidetracked with the guy with the sideburns especially the fact he was popping in my face with the ‘you could be THE ONE in 4 in jackpot winners’. Lottobytext.co.uk is a lottery service provider through text or online play for UK National Lottery and EuroMillions syndicates. Okay – so how can I be ‘the one’ or do I want to? 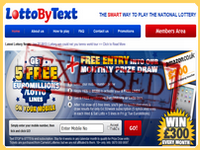 Lottobytext.co.uk initially offers 5 free lines of a EuroMillions syndicate or National lotto lines. They are clear on the fact that after the 1st draw (your free lines), you will get 15 syndicates lines (5 syndicate lotto lines for Wednesday & Friday’s lotto, and 5 syndicate lotto lines in either Tuesday or Friday’s EuroMillions) at a cost of £4.50 per week. In going for the free five, you’ve signed up for a subscription. Syndicates are limited to 49 shares though it took live chat to find out that info. There is one more thing though. In chatting with their online help, the syndicate only gets 1/4 of any jackpot. A subscription is a regular delivery of a service. Most of us identify this will newspapers and magazines. In this case, you have authorized Lottobytext.co.uk to charge you weekly for your lottery subscription. This continues until you send them the word STOP (in the case of texting on mobile phones) or cancel the payment through contacting your Credit Card/PayPal/Debit Card provider and then tell Lottobytext.co.uk. I don’t usually jump right into complaints when doing a review but this time it is hard not to. Once a player has signed up, it appears the charges start happening very quickly. There is some question whether the system automatically signs a player up for the £1.50 or £4.50 weekly option. If you’re not paying attention to your mobile phone (it’s upstairs on a charger or turned off), it can start adding up pretty quickly. If you’ve joined online, then it’s time to start monitoring your method of payment. It also appears that though Lottobytext.co.uk send the lottery lines of the syndicate to you by mobile phone, they don’t indicate the date of the specific draw. There were also several sites that say they randomly target people who have no idea why they are receiving texts but get charged for them. What Else to Worry About at Lottobytext.co.uk? PhonepayPlus, a UK mobile phone provider, has launched an investigation on Bitstacker Ltd. (owner & promoter of Lottobytext.co.uk) as well as four other companies as a result of “evidence had emerged that each had been marketed though ransomware-style browser lock-in tactics”. I won’t get into the technical aspects of what this is except to say it appears it is a form of malware known as ransomware that locks consumers’ Internet browsers and forces them to interact with online offers and/or pay a ransom to unlock the computer. Lottobytext.co.uk pointed out that the use of ransomware isn’t being done by them but by hackers from anywhere. They also clarified that this is being investigated and they look forward to the results. This could happen to any site by anyone and it’s important to protect your computer. Players have to be over the age of 16 to win plus, be the confirmed owner and have a mobile phone or email account and that the card (method of payment) or mobile phone has not been reported lost or stolen. Buried in the small print at Lottobytext.com is the fact that only residents of the UK can win the monthly draw/sweeps/lucky dip. They say they do a free monthly draw including all syndicate participants as long as a player has used their service for 4 consecutive weeks or spent a minimum of £18. They don’t say when this takes place and the prize is some form of shopping voucher (this month is Amazon) in the amount of £300. Though Lottobytext.co.uk does offer a live chat, they are slow to answer and do at times ignore questions. They do offer a snail mail and free phone number to contact them as well as email address. Besides the fact the payout isn’t great (and there were complaints online that they didn’t actually payout), there is enough noise about the parent company that our team got nervous and quickly started running a full system scan on our computers. We definitely give Lottobytext.co.uk. If you do decide to play, we’d recommend that anyone in the UK keeps an eye on their mobile phone for notices, do not respond to free offers and definitely contact your provider if you start getting charged for anything that you haven’t personally authorized! There are a lot of trustworthy lottery service providers available so make sure you are sure about who you are playing lotteries with! Did NOT sign up for anything wife got text saying: text STOP, so she did then they kept taking £4.50 until I noticed £22.50 + these are scummy scammers who need taking down. I am well pissed off! I was minding my own business playing a game on my mobile when I was “chosen to receive a new iPhone”. Answer questions and it is yours, I thought why not? I will tell you why not after 5 minutes of yes or no they asked me to send a text to confirm for my phone… £4.50 a text. I have no credit in my phone as it is for games only, and now I am being hounded by texts from this mob. Yes, I can opt out… But it costs to text it. Either give me my promised prize or not I don’t care. STOP TEXTING ME! I’m glad I’m not in the UK so I won’t even consider this one – and I told several friends to read this as they are there. One was about to do it – I said READ THE REVIEW. I have enough advertising I get on my phone never mind stuff that incurs charges – and that it might get out of hand. Don’t do it. Lotto by txt stole 1500 of me never had a win biggest con in history what is the world coming to “love thy neighbour”. I currently subscribe to the ‘by phone’ version of this service. I considered joining the ‘by web’ version, but found that when you are required to give card details a Hypertext Transfer Protocol Secure (HTTPS) is not used. I contacted them but got nowhere. I refused to join due to this insecurity. Think I might send STOP to them now. I can’t seem to login the site won’t load up going to cancel my subscription if I can’t login by tomorrow. hi un happy taking you guys to court..bought so many tickets. no raffles. on any ero. you guys are scam. i want my refound of 346. pounds. including police charges.and compesation..of 4000.penalty aplyed.this is not a prank .! !